It has finally become an appropriate time to post this manicure! I painted these in the beginning of December in hopes that we would get some snow, but alas, snow never came. I tucked them away once I started all my Christmas nail art and planned on saving them for the day when the snow finally came. And finalllyyy, it was this week!! We ended up with a white Christmas which I do not think has happened in a few years. My mind might be a little fuzzy, but I clearly remember last year having a green Christmas. Last night we got hit with a snow storm that left us with a foot of snow! I love it, call me weird and crazy, but it's just so pretty! The pine trees tonight were all still covered from 24 hours earlier and it really was a winter wonderland. If New Years Eve weren't right around the corner, I'd be grabbing my nail art brushes and re-paint this manicure just to celebrate the snow! Let's take a look! Guess where these pictures were taken....it may or may not have been outside of Sally Beauty during the .5 seconds of sun. To get these nails, I painted on 3 coats of Precious Metal, my favvvorite "metallic" polish. It was sold as part of the Sinful Colors Metallic collection so that's why I put metallic in quotations. To me, it is not a true metallic polish since it doesn't have that frosty, metallic look. The glitter flecks in it give it a sort of metallic-y gleam I guess, so that's why it may have been included in this collection. I'm a sucker for blue polishes, so I had to purchase it, and for 99 cents, how could anyone go wrong? It's a tad sheer, but builds up nicely in three coats, and leaves you with a gorgeous dark blue, glittery, shimmery nail. 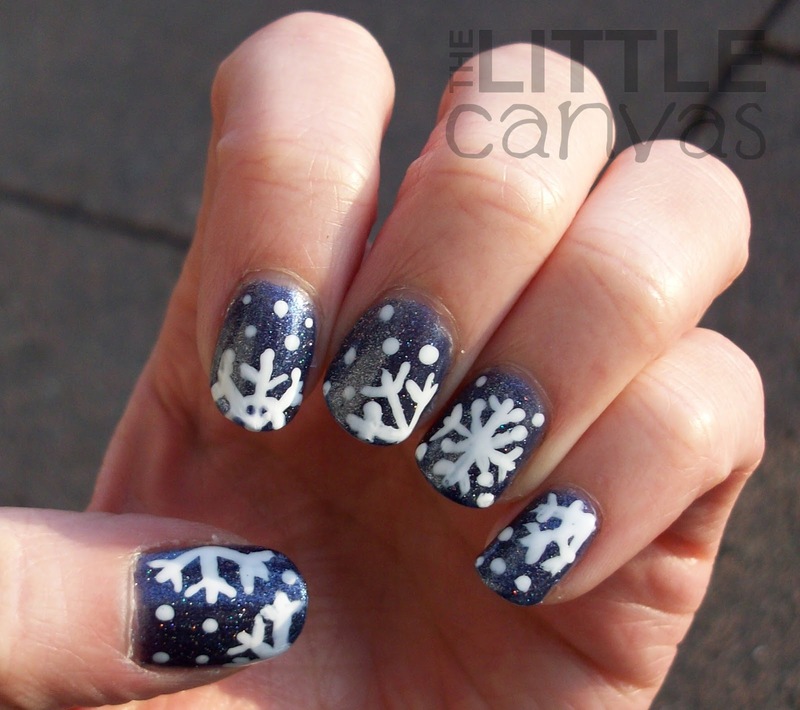 To get the snowflakes, I painted them on using one of my nail art brushes and Snow Me White. 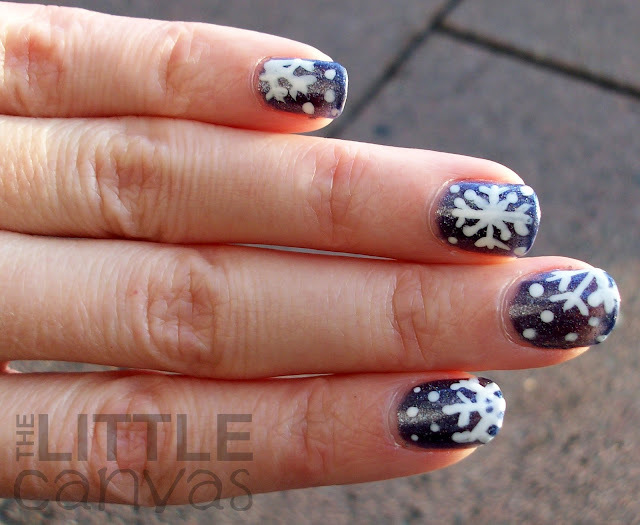 I didn't like how the snowflakes looked on the nail with nothing in the background, so with my dotting tool, I added some white little snow-dots. What do you think? 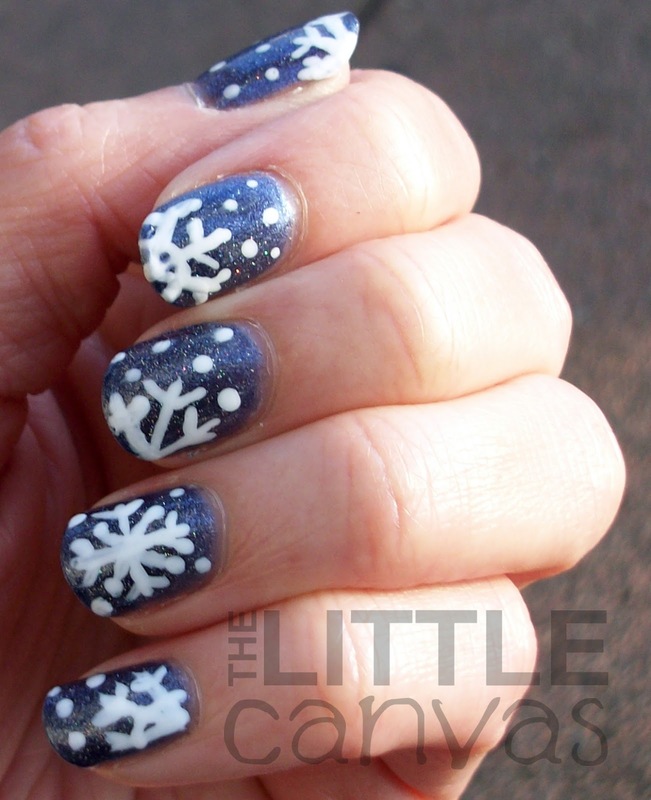 Have you done snowflake nails yet? Did you get hit by the snow storm? Do you own Precious Metal and love it as much as I do? I loved your snowflakes, I tried some using the BM plates, but yours handmade snowflakes are gorgeous!